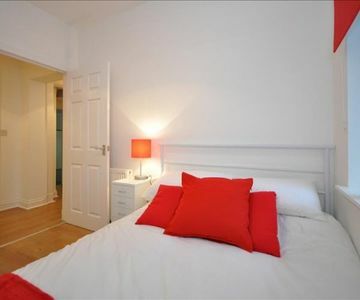 In a fantastic location for Glasgow city centre , this apartment offers self-catering accommodation for up to 6 guests. This beautiful 2 bedroom apartment features a lounge area and flat-screen TV. Private bathroom, hairdryer, towels and linen are provided. There is a fully equipped kitchen including a washing machine, ironing facilities, oven, toaster, fridge and essential kitchenware. Free onsite parking. Excellent road and rail transport links. In a fantastic location for Scottish Hydro Concert Hall, Ibrox Stadium and the museum and science centre. A great base for anyone working or visiting Queen Elizabeth Hospital as it is only a couple of minutes drive away. Glasgow City centre and Glasgow Airport are only a 10 minute drive away.